The Republicrats (that is, the “Democrats”) are not the answer — unless you want more of the same: poorly performing schools, poor public safety, corrupt government, high unemployment, childhood poverty, inadequate city services, and politicians for sale. As an alternative, look around our website, see what makes us different. The DC Statehood Green Party Event is not a business party. DC Statehood Green Party Event prospects are except sale. They do decline business allurements. And also our system reveals where we depend on problems that matter to daily individuals. 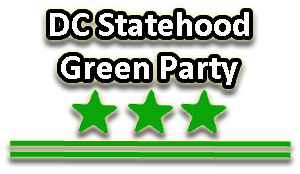 The DC Statehood Green Party is the party with the candidates you can trust. Move toward real electoral change…it’s been decades since DC has seen true democracy. Democrats have ruled this city since the 1970’s and displacement, disenfranchisement and diarray have been the order of the day. The only accountability has been at the ink pen of the US Attorney. Time to elect servants who will be accountable to the people! Contact us. Give to our movement. We look forward to building our peace and progress party with the people of the District of Columbia. Information about the General Assembly meeting of the DC Statehood Green Party, as well as other party related events.